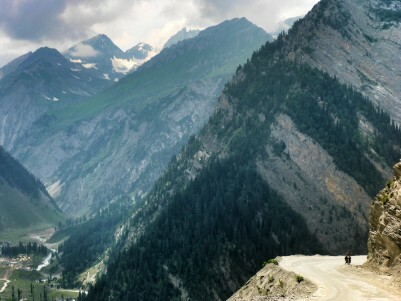 Like the Karakoram highway in Pakistan, the Indian Himalaya had been a dream cycling destination for me for years. When India comes to mind, many people conjure up images of intense crowds and heavily polluted cities. 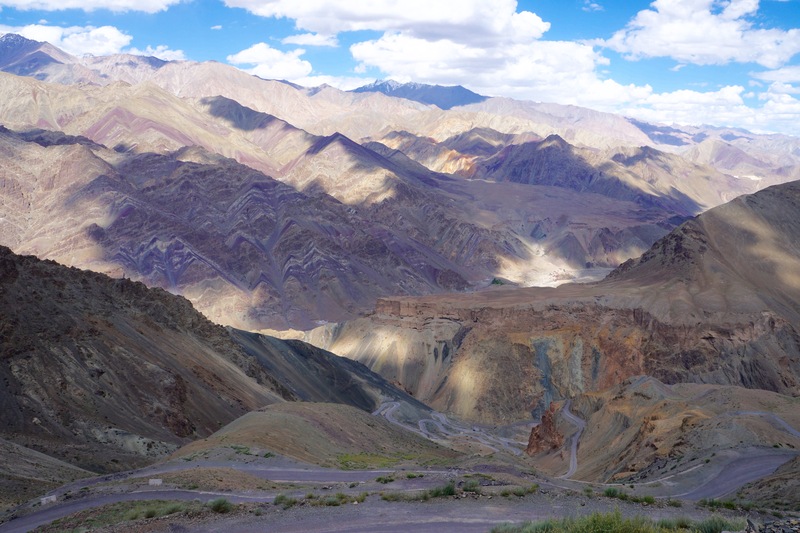 The Himalaya of India couldn’t be more different. In fact, it can feel like an entirely different country altogether. Due to the extreme geography, much of the land isn’t suitable for human habitation. 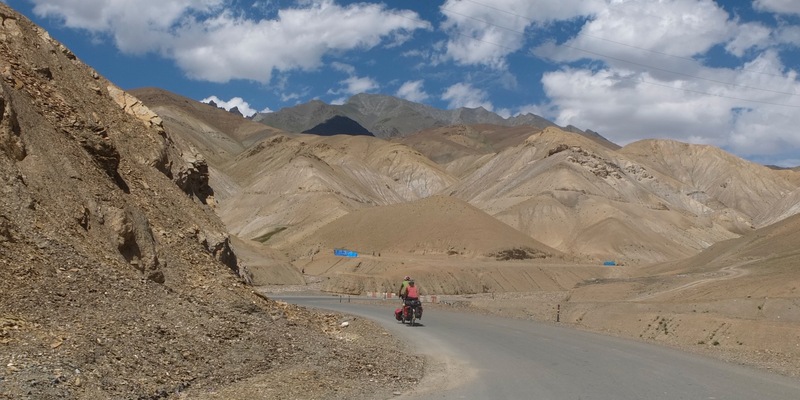 Having now cycled the Karakoram Highway, The Andes, Tibet and the Pamir highway I can say that the Indian provinces of Kashmir, Ladakh and Spiti have some of the most extraordinary mountain scenery I have ever ridden. 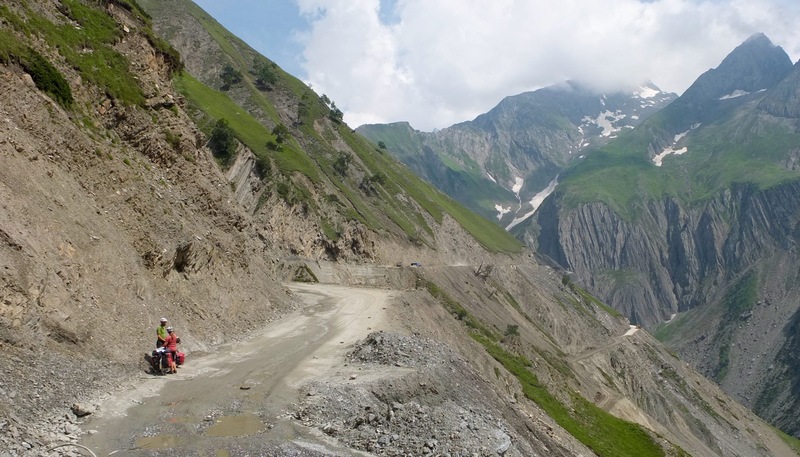 My 1600km route through this dramatic region began in Srinagar, Kashmir through a region historically in dispute by India and Pakistan. 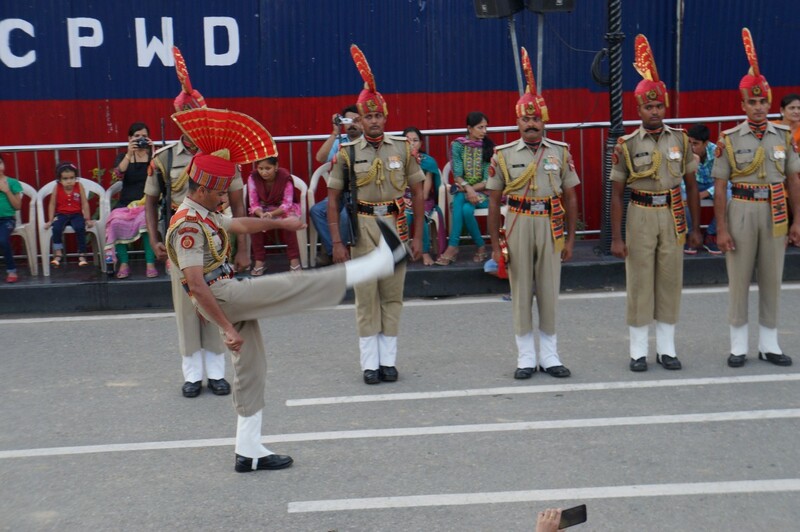 When I crossed the Wagah border from Pakistan to India I was a long way from the mountains. Like in Pakistan, I was still caught in sweltering August heat as I cycled to the hectic city of Amritsar. At this point I was eager to get back into the hills. Marcus and Kirsty were one year into their two year trip from England, heading eastwards towards Australia.We hung out in Amritsar for the next few days taking in the unique atmosphere of the Golden temple, while battling various stomach ailments – a welcome present from India. 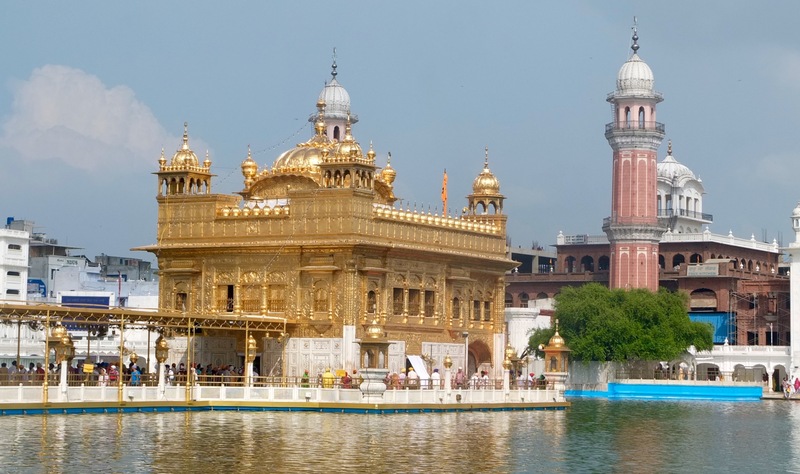 The ornate main temple is coated in 750kg of gold and is surrounded by holy water, where one can take a dip. Crowds of pilgrims with Sikh men in colourful turbans and thick beards glided in and out of the temple complex. When entering the temple, one must cover their head and remove their shoes. Inside of the temple are a group of musicians singing the Sri Guru Granth Sahib (Sikh holy scriptures). It takes two and a half days, 16 hours per day to sing the entire book – and when it is finished, they start all over again. The tranquil music is broadcast throughout the temple complex adding to the serene atmosphere. 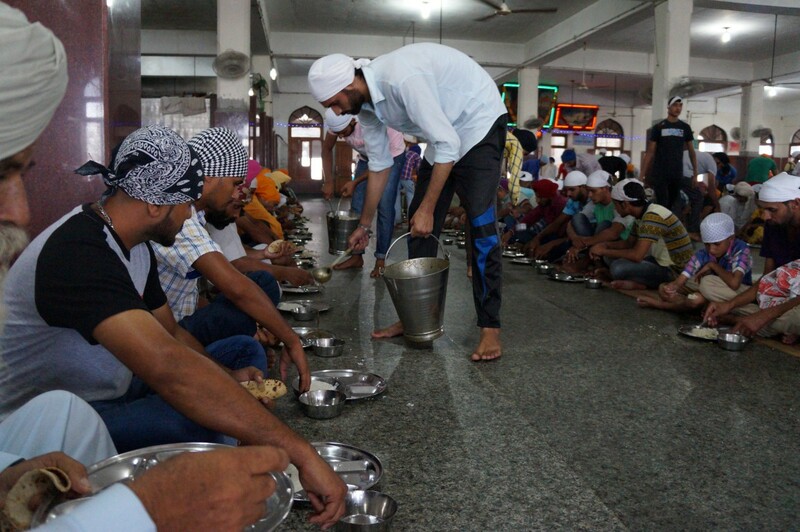 One of the most fascinating experiences of visiting the Golden Temple is to take part in its free meal service. With over 100,000 people eating at the temple per day, the level of organization is incredible. At the entrance, each diner is handed a metal try and joins the cue of thousands into the eating area. The line moves swiftly and I am directed into a large room with rows of people and their trays in front of them. Once I am seated people, whiz by with buckets of dahl and rice pudding swiftly dropping a ladle full onto the dishes. Next, discs of nan bread are dropped up and down the rows. They even come by for seconds. The most intriguing part is the dish washing service. Thousands of trays are washed and tossed back and forth with a rhythm that almost seems rehearsed. The loudest and most unusual orchestra. 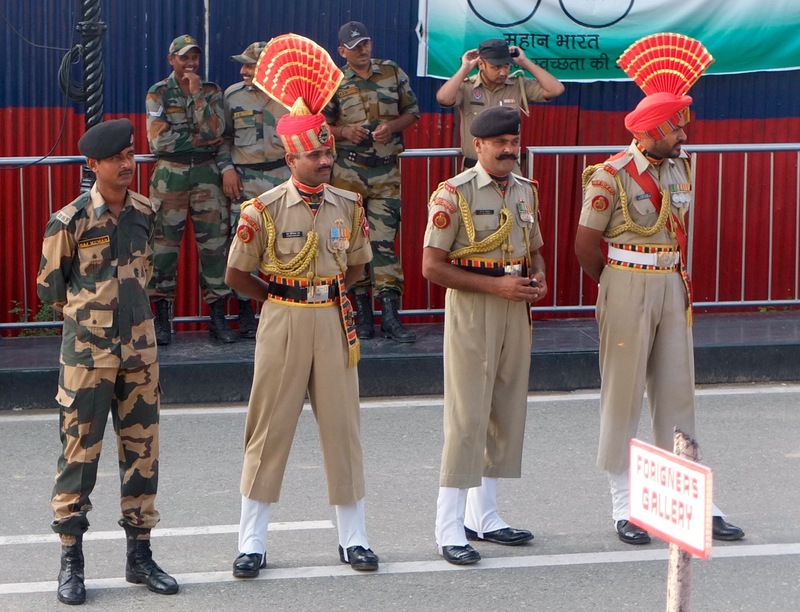 While in Amritsar, we also decided that it was a good idea to check out the famous border retreat ceremony at the Wagah border with Pakistan, where I had just come from, 30km away. At the border, we took our seats in the bleachers, at the “foreigners gallery.” Loud, high energy Indian music blasted through speakers, amping up the crowd. It felt like I was at a sports match. Through the border gates in the distance I could see that the Pakistani side was even louder than the Indian side. In hindsight I should have experienced it from the Pakistani side when I was there. The ceremony itself was a ridiculous show of military bravado between both sides. It was a competition of who could kick their legs the highest or march with the most authority. All of this happening with a loud drum roll in the background and crowds cheering. At the end, the flags on each side of the borders were lowered and the gates shut. While the whole thing seemed like some sort of parody, it was completely serious. A entertaining way to symbolize the ongoing tensions between India and Pakistan. And they did this every night. To get a better idea, here is a video from BBC of the ceremony. The heat of Amritsar was getting to me after a few days, which didn’t compliment the assault on my stomach from a suspect Punjab Lassi (even though it was the most delicious lassi I’ve ever had). Marcus and Kirsty were also headed to Srinagar and we all had opted to take the train to Jammu in order to avoid the heat and heavy traffic of the lowlands. We arrived at the train station around 11:30pm for our 1am departure and it was still stupidly hot. When simply sitting still and breathing makes you burst into a sweat, it is just too much. Eventually they gave up and we would simply have to pay a 1000 rupee bribe (about $15) at the other end for all the ‘inconvenience’ we had caused putting the bikes into an empty luggage car. In Jammu, I continued to Srinagar via a shared taxi. 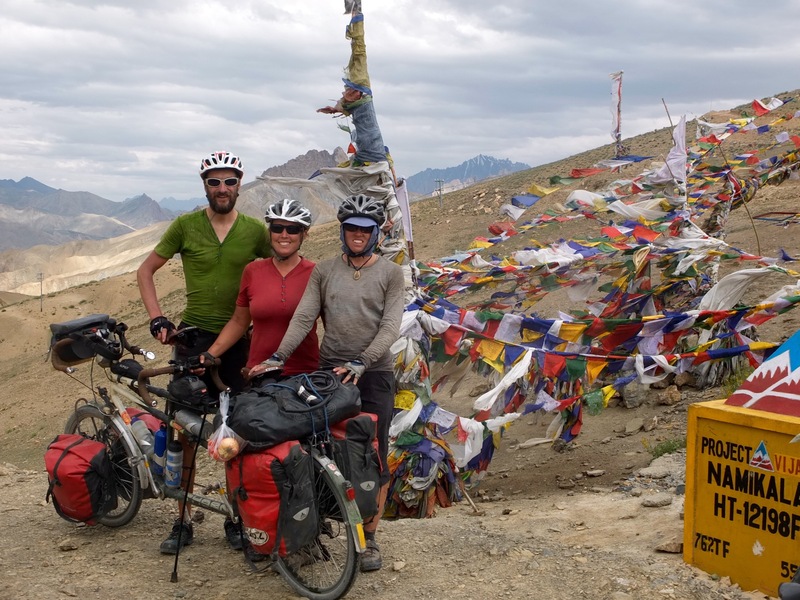 Marcus and Kirsty had planned to cycle, but Kirsty was still suffering badly from “Delhi belly” and they decided to get a hotel for the night. The traffic was heavy all the way to Srinagar and the roads twisted and turned sometimes hugging the edges of dramatic cliffs. It really tested my tendency for motion sickness and with the insane driving I wondered if I would be safer on a bicycle, being in control of my own vehicle. 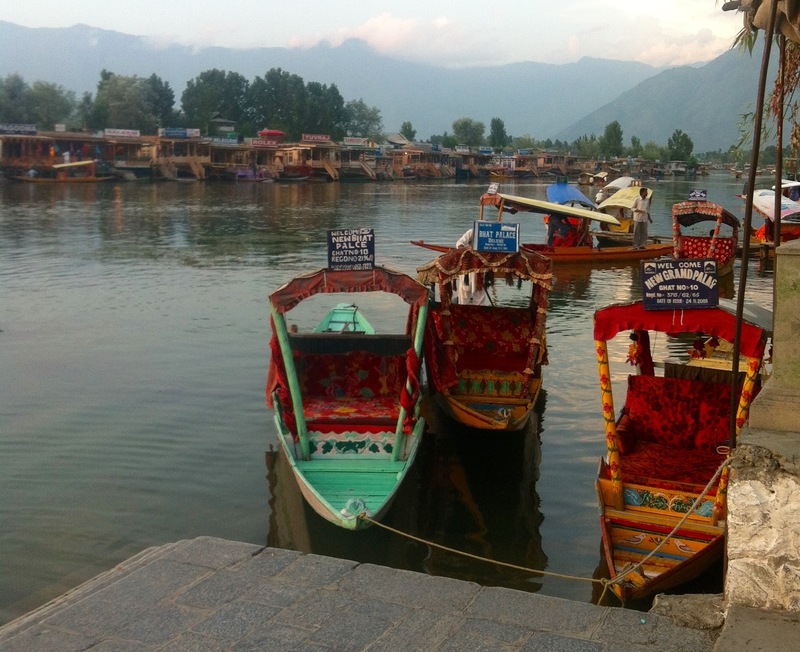 Shikaras in Srinagar – like a water taxi. 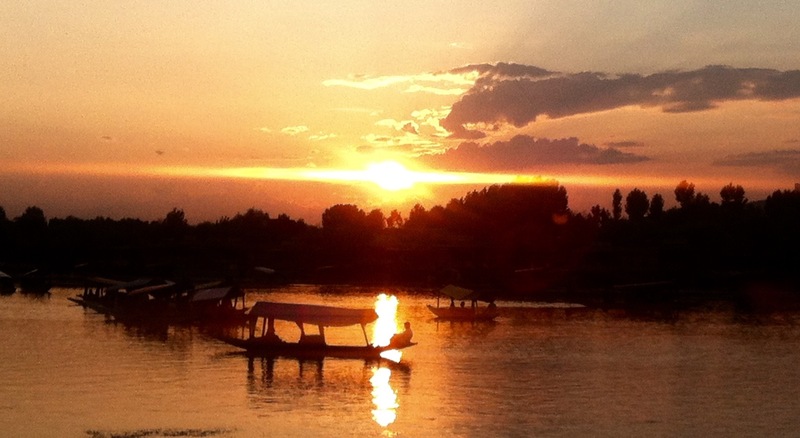 Srinagar is a unique place because of the communities that live on houseboats. Along with staying on a houseboats, you can take a shikhara ride (a small boat) to explore this watery way of life with floating markets. Like in most cities, I was a lazy tourist and instead wanted to spend my time preparing for the start of the Himalayan ride. The night before I was preparing to set off, I was adjusting my front brakes when I noticed a large crack in my front rim. Just over a month ago, my rear rim had cracked just outside of Urumqi. “F***!” I thought. So then I had no choice by to stay another day in Srinagar to find a new rim. I went to Hero Cycles, India’s flagship brand, whose quality of bicycles made Wal-Mart bikes look like Cervélos (sorry if this reference is too North American – it means complete sh*t). I ended up having to go back the next day, because the mechanic was away. I ended up with a big hunk of Indian steel that weighed twice as much of one of my alloy rims. The best part – it only cost $10. I couldn’t take a risk with a poor quality aluminum rim, that looked like it would crack if I stepped on it. The shop only stocked 36 spoke rims and my front Dynamo hub took 32 spokes, so I had no choice but to carry my own hub and spokes and get a whole new wheel. So, armed with more weight, less braking power and the power of steel my bike was ready for the Himalaya (maybe). My delay in Srinagar ended up putting me on the same schedule as Marcus and Kirsty, who had also decided last minute to take transport from Jammu. On a lucky meeting online, we decided to rendezvous the next day to start the ride together. 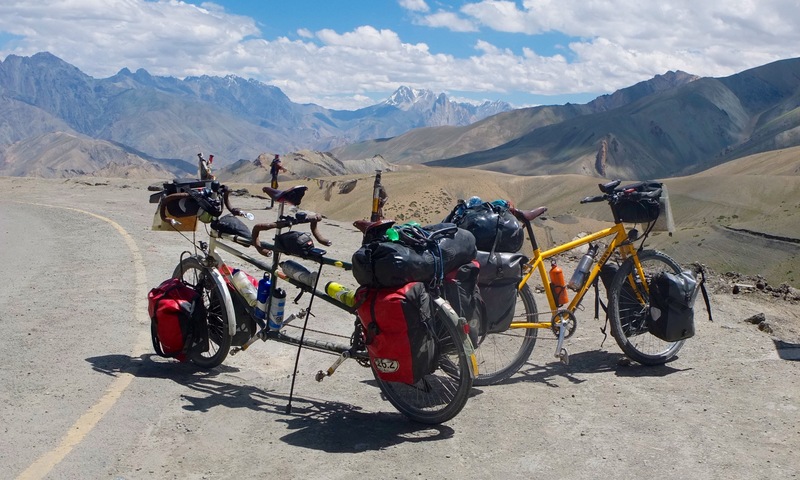 The next morning, after getting a good laugh at my new steel rim we started out on the road to Leh. 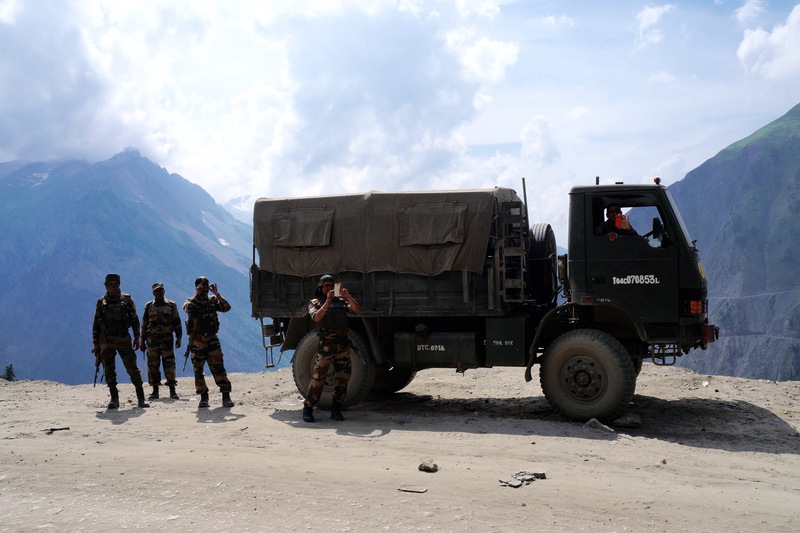 It was a very hot and humid day up to Sonamarg. For me it was one of the toughest I’ve had so far. The valley of Kashmir was lush and green and so far, fairly populated. 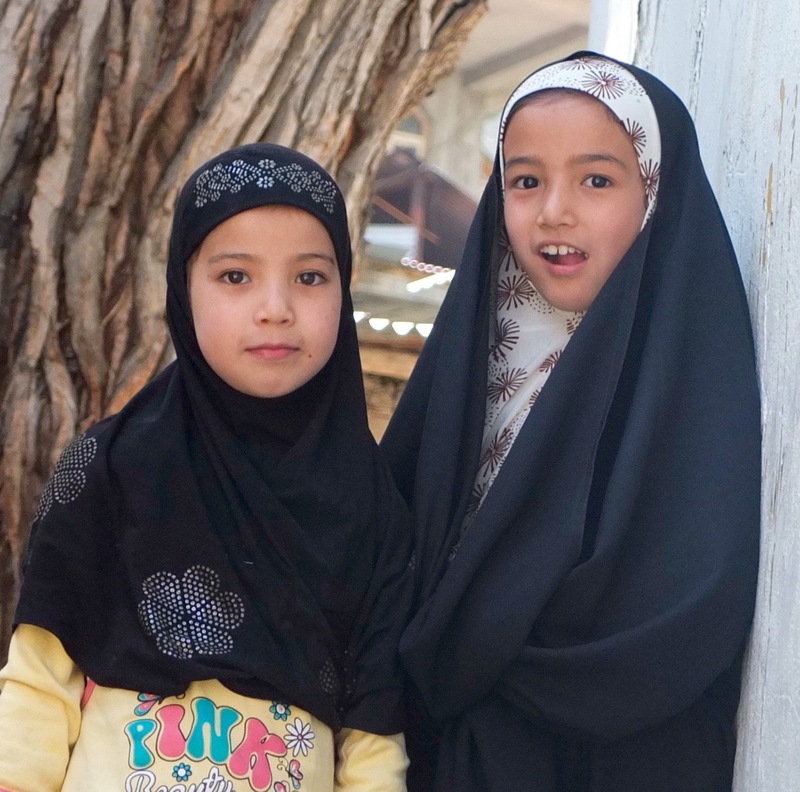 This region of India is mainly muslim, with Urdu as the main language (also the official language of Pakistan). This area had a very heavy military presence and we could see many soldiers with AK-47s hanging out on the hills above the road. It was nice travelling with a tandem, because for once the attention was being taken away from me! We would hear indecipherable words being spoken and all of a sudden “ohhhhhh – double cycle!” Whenever we stopped, a crowd of locals immediately formed. 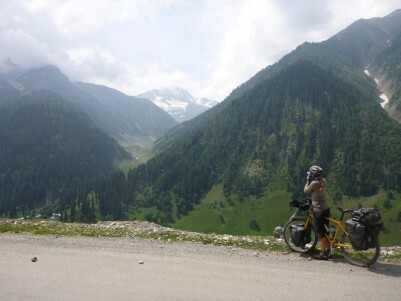 I was completely exhausted when we arrived in Sonamarg and I guess in a heat inflicted stupor I failed to notice that my front brake had been rubbing on my new rim the whole time (doh! thanks Marcus!). We had climbed over 1000m that day and would continue to ascend another 800m to the Zoji La pass at 3528m before dropping down to Drass. Soft greens morphed into more barren rock as we ascended higher and higher. 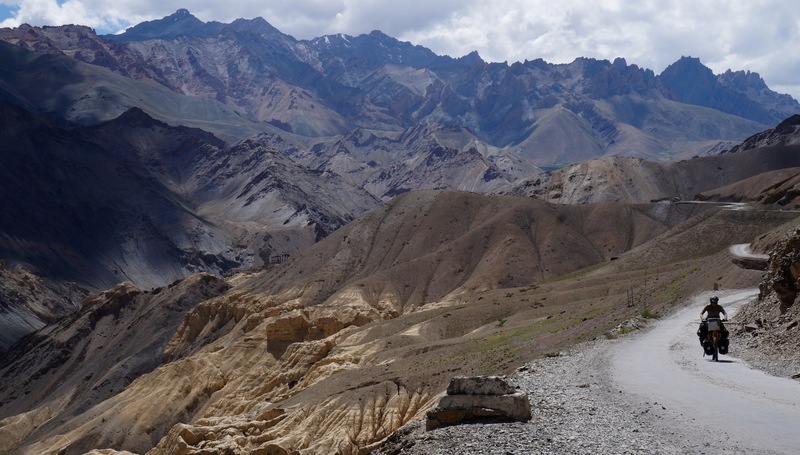 Today, I was relieved to be temporarily escaping the heat and really felt the lure of the Himalaya. There were still many army vehicles about and soldiers on patrol. We were never bothered, only for photographs. Military guys on the Zoji La, armed with their smart phones. 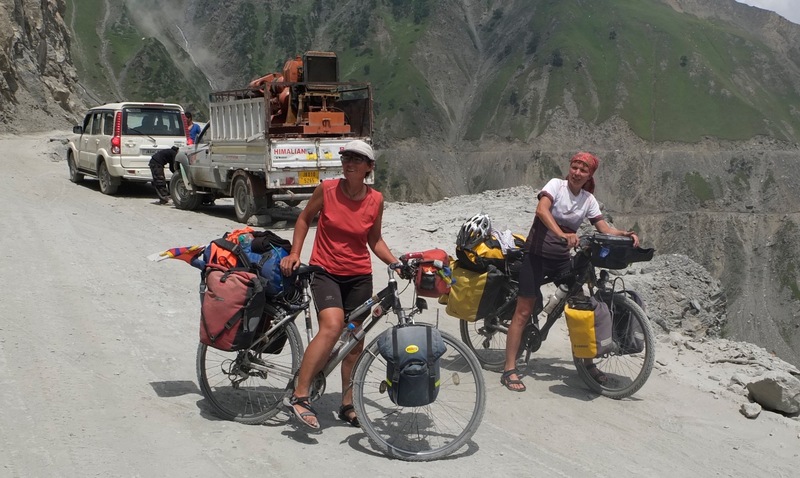 It was also becoming common practice for vehicles to stop in front us and having passengers run out for “just one selfie!” We met more touring cyclists this day than elsewhere in the himalaya. Amongst them were several men and women from Poland along with guys from Ireland, USA and the UK. 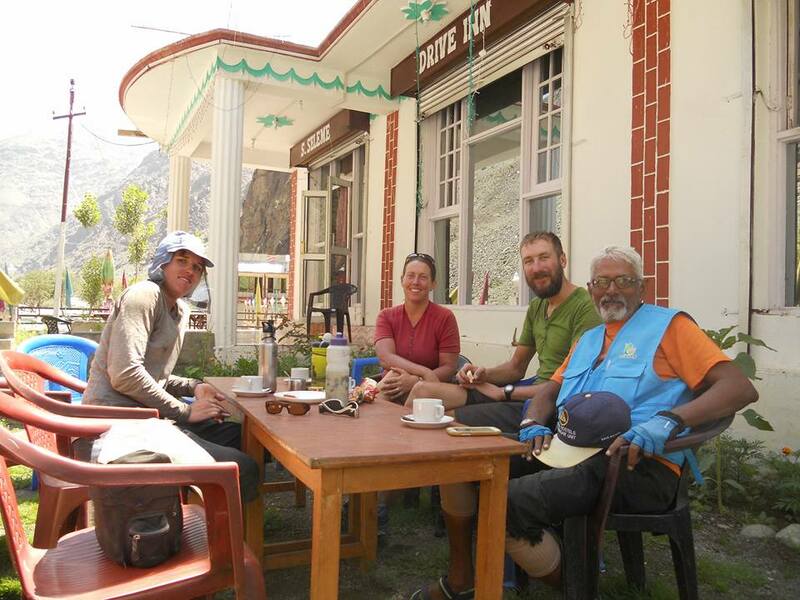 After summiting the rough but beautiful climb up the Zoji La, we came to a small tent dhaba (parachute tent restaurant) and had some Maggi instant noodles. This would become a staple of our Indian Himalaya diet along with dal (curried lentils) and rice. We descended to Drass and found a friendly little dive hotel, sharing a room for about $1.50 USD each. 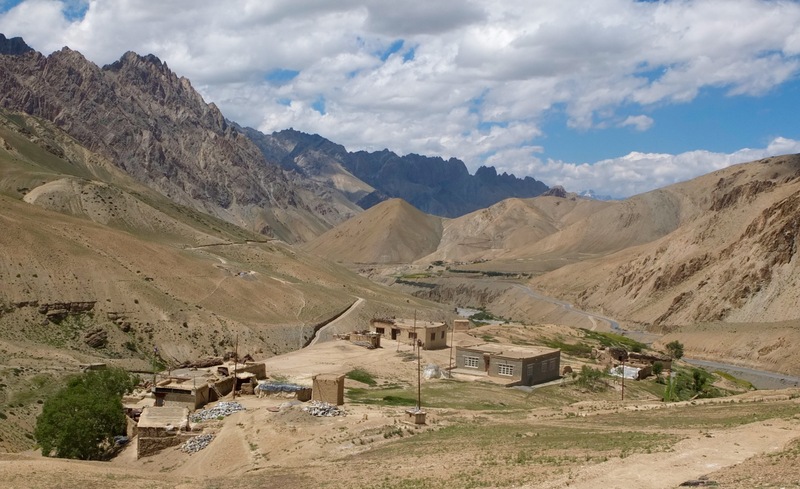 Drass claims to be the second coldest inhabited place in the world, where a temperature of -60C was recorded in 1995. Hard to imagine when it was in 30s when we arrived. There, we met a Russian cyclist with an enviable, ultra light set up of two tiny panniers. It was only a matter of time before I realized how tough hauling 40kg up in the Himalayas would be. 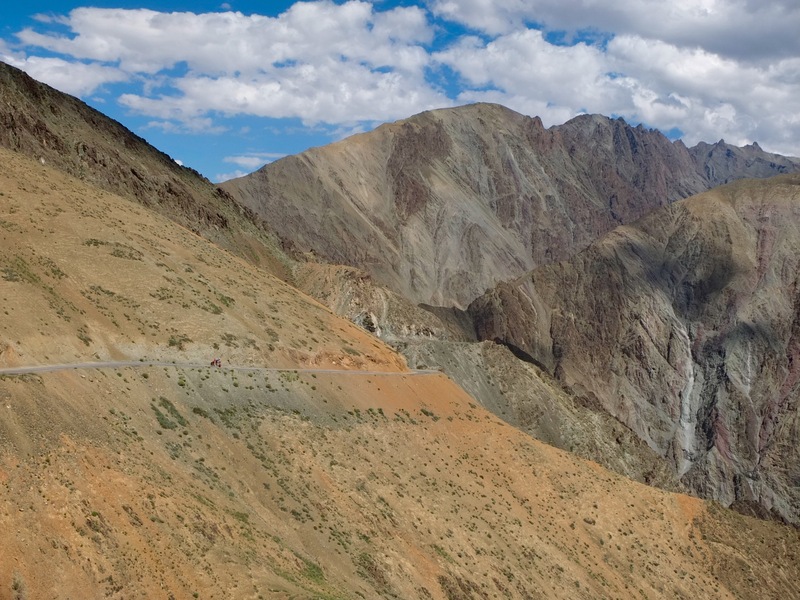 After the climb up the Zoji La, the road to Leh was in excellent condition. 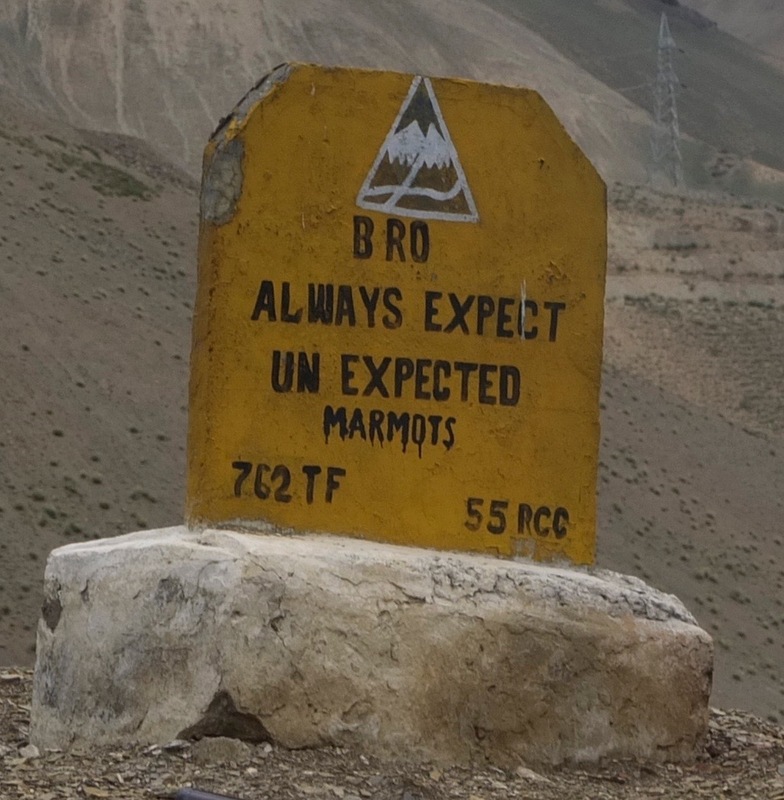 We enjoyed many long, swooping descents to Kargil. En route, we met Zaver from the South of India doing a 5400km ride through the country. At 30 years older than me, he could still ride faster than all of us. The heat came back full force again and reached 35 degrees, even at 2700m. Kargil reminded me of Pakistan, with men running about between the fly invested shops in Salwar Kameez and girls in tiny hijabs. We decided to take a break from the heat and indulged in several bags of chips and ice cream. We had opted to camp that night, but it was proving to be tricky in this area. Any area that was flat was populated. 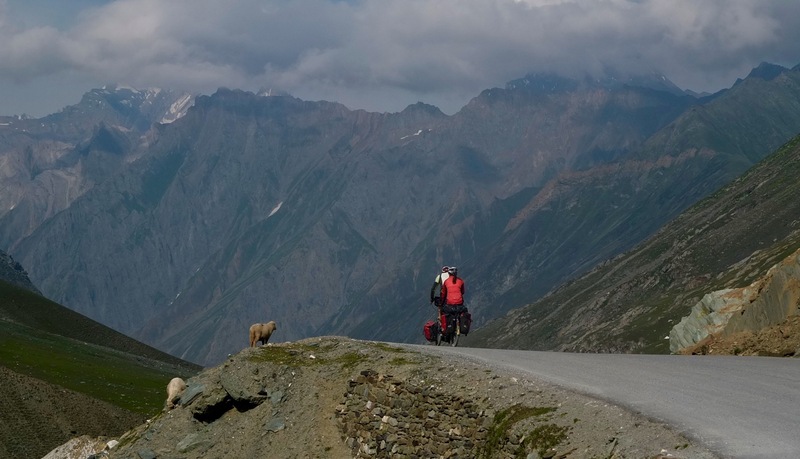 Also, my invaluable guidebook, Laura Stone’s amazing Himalaya by Bike had advised against camping from Srinagar to Kargil due to the military presence. We eventually found a place barely tucked away off of the road – not ideal and more like a last resort, but not the worst I had seen. It was nice to camp at night with friends – something I often miss while cycling solo. I was also grateful for Marcus’s mechanical skills to help prevent my steel piece-of-junk front wheel from falling apart. 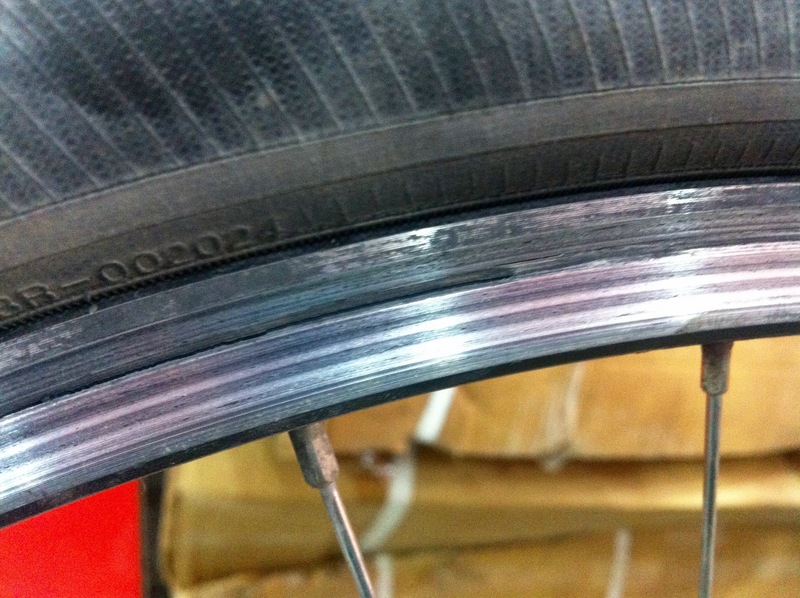 While the rim itself seemed bomb proof, the hub was already rattling loose after a few days. Along the way I also enjoyed learning some British. 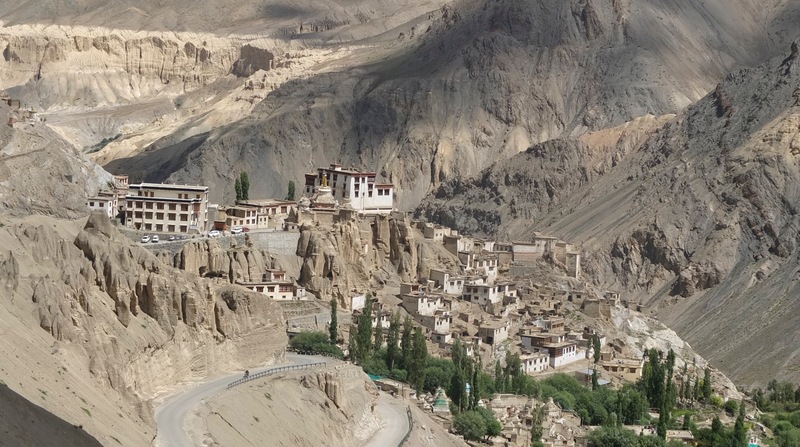 We had now entered Buddhist Ladakh and monasteries began to replace mosques. 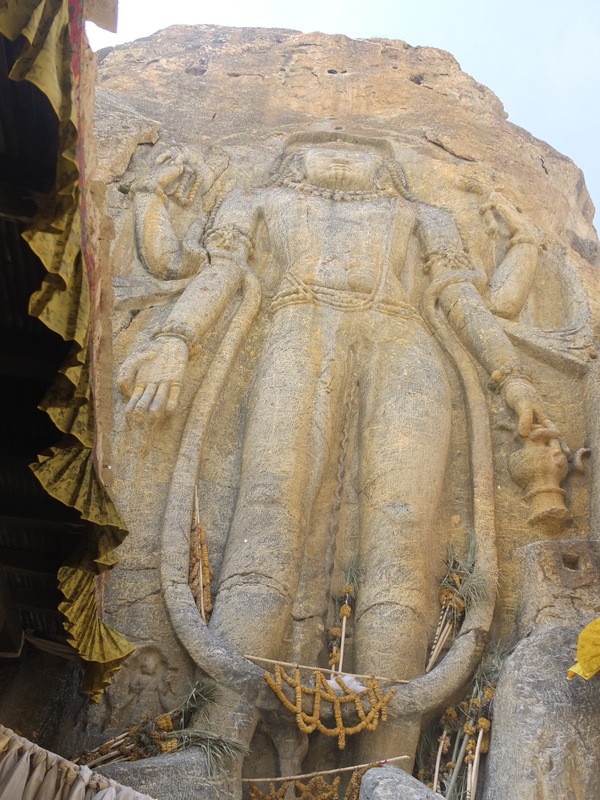 In Mulbekh, we saw the impressive 30 foot tall limestone structure of the Maitreya Buddha. Scholars date it back to the 8th Century. Today, unfortunately, it was Marcus’s turn for feeling under the weather. Since we had started cycling together, there wasn’t a single day where the entire group was feeling 100%. The food in India was just not agreeing with us. Still, we decided to push on and climb the Namika La pass at 3700m. The landscape made me feel like I was on the moon. The descent was incredible – fast and smooth. 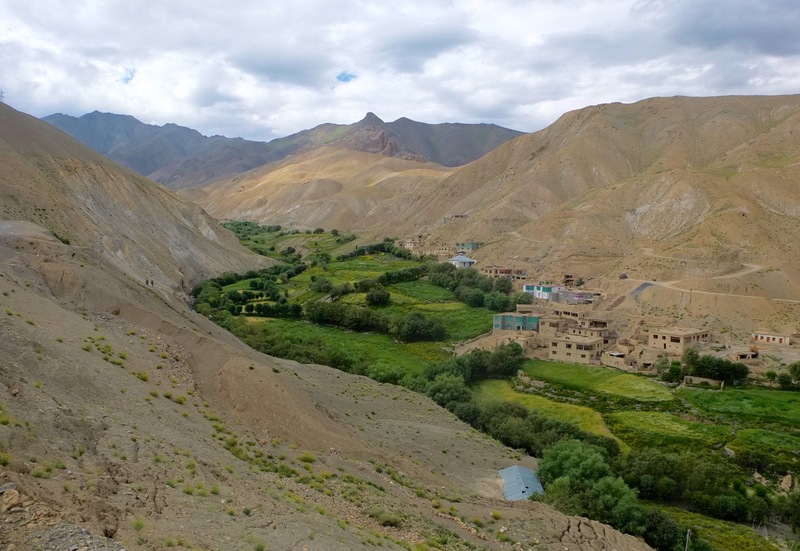 Tucked low in the valley floor were villages surrounded in bright green – a contrast to the stark beige mountains rising above. The scenery got more and more dramatic and hit its peak the following day. 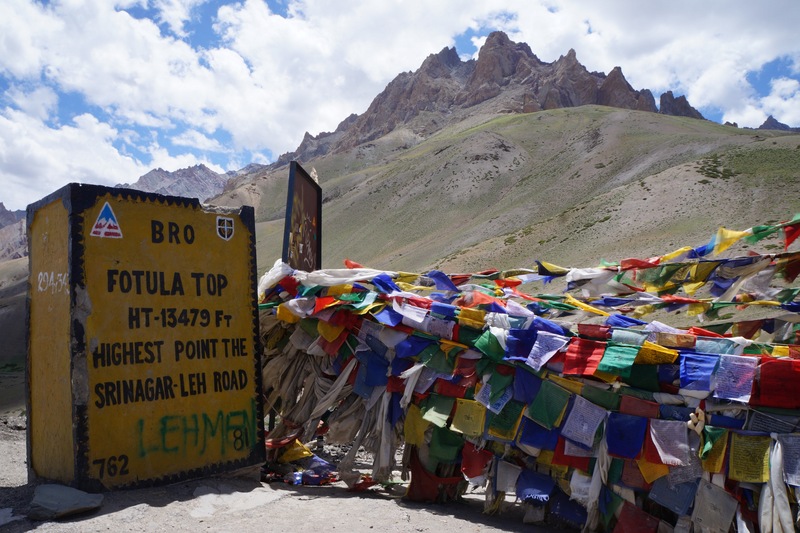 We climbed to the highest pass on the Leh-Srinagar highway, the Fotu La pass at 4108m. As I neared the top, I could see the Tibetan prayer flags. With a rare burst of energy, I surged towards the top. 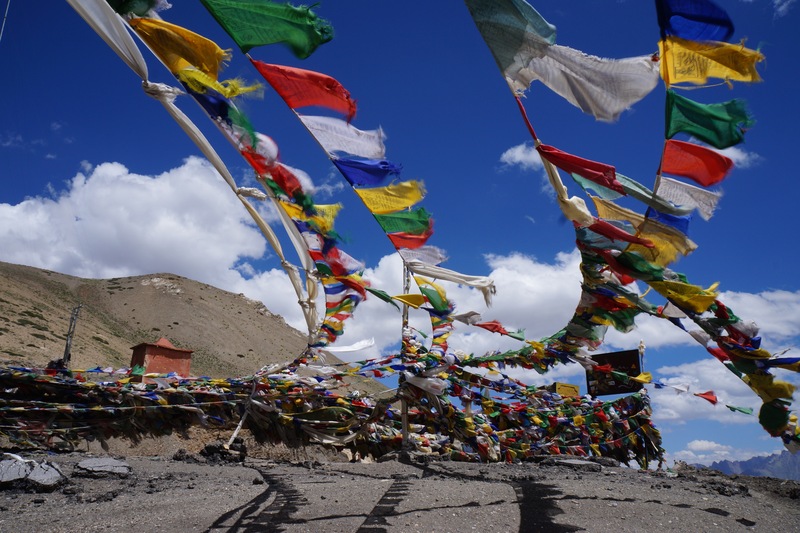 Since I had the privilege of cycling in Tibet in 2011, the sight of prayer flags on the passes always stirs up something inside of me. 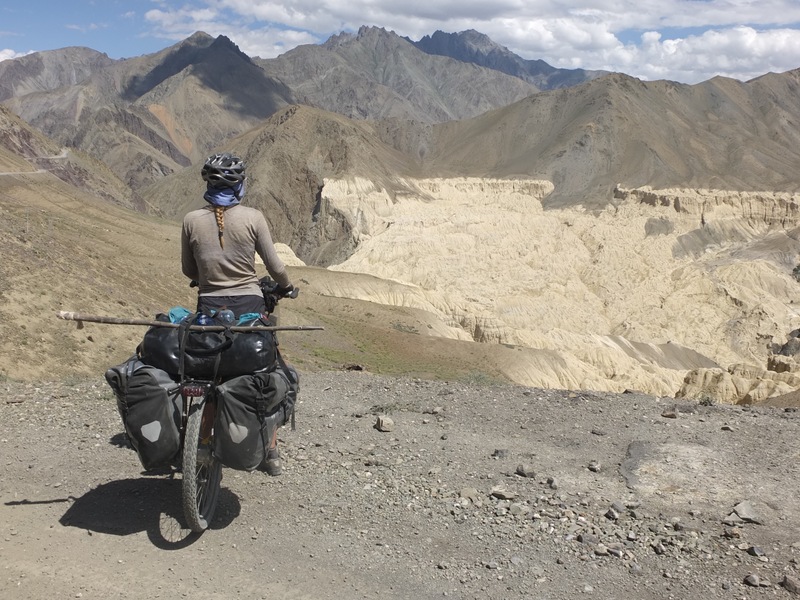 For me it is reminder of imminent victory after struggle and the spiritual experience of cycling in the Himalaya. At the summit we met several cyclists in a group who had climbed up the other way. 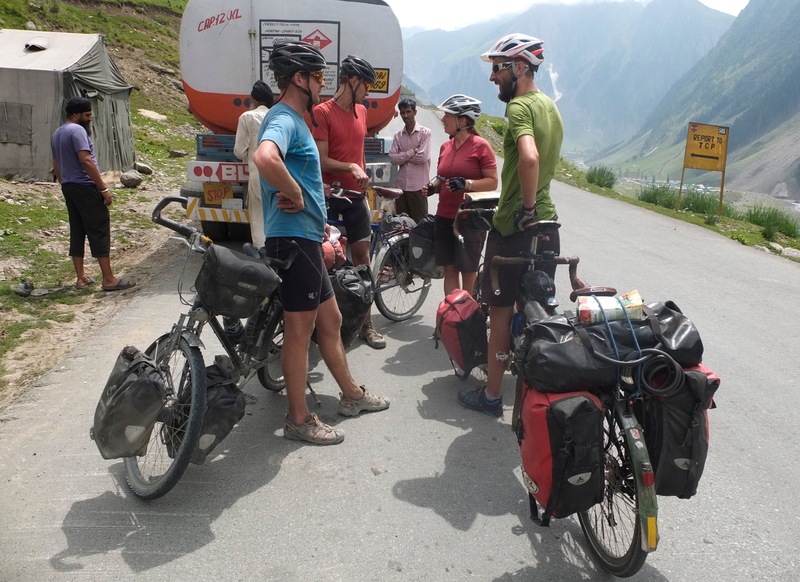 We met a few people on their first supported bicycle trip from the South of India that had never been at altitude before. They were absolutely thrilled to reach the top. An amazing accomplishment. The descent was exhilarating and from there it only got more impressive. 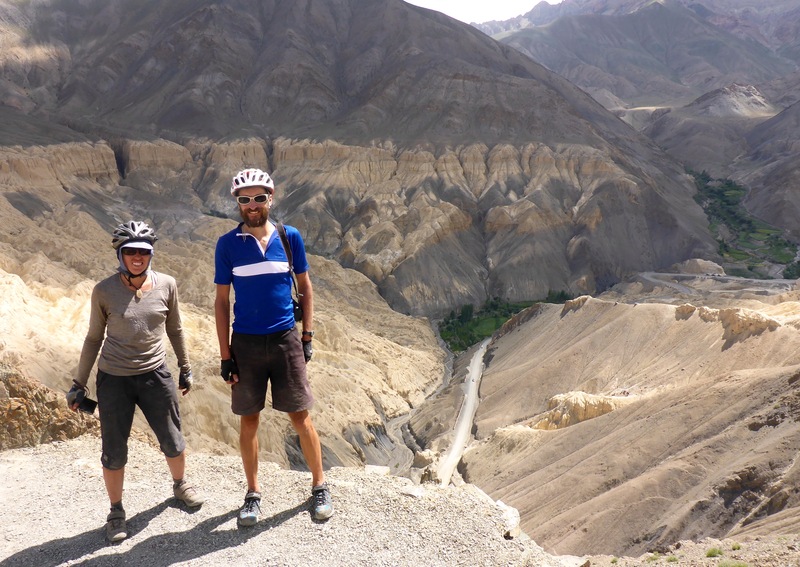 In Himalaya by Bike we had read about an alternate route that went high above the valley through Lamayuru, known for its famous monastery. 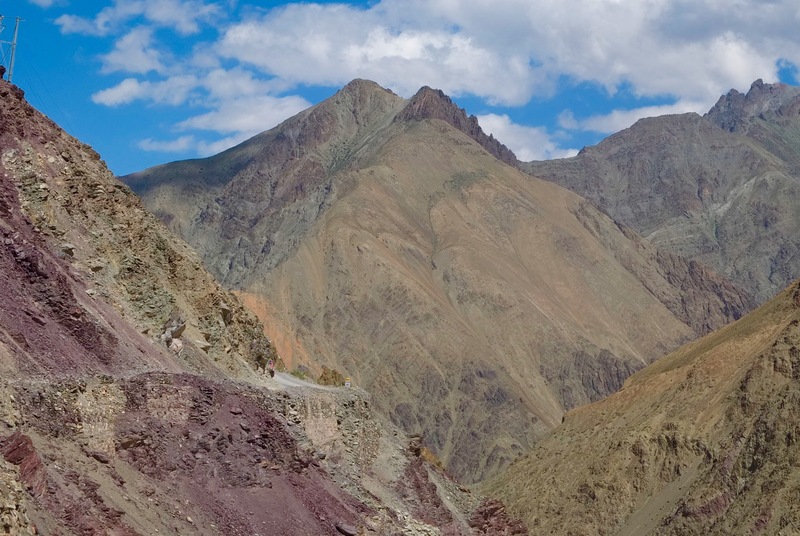 Along this road we would be descending down 17 hairpins called the Jalebi bends – through “the most extraordinary landscape you can imagine” as the book had claimed. With that description, we knew we had to take the road. This place was a geologist’s paradise. 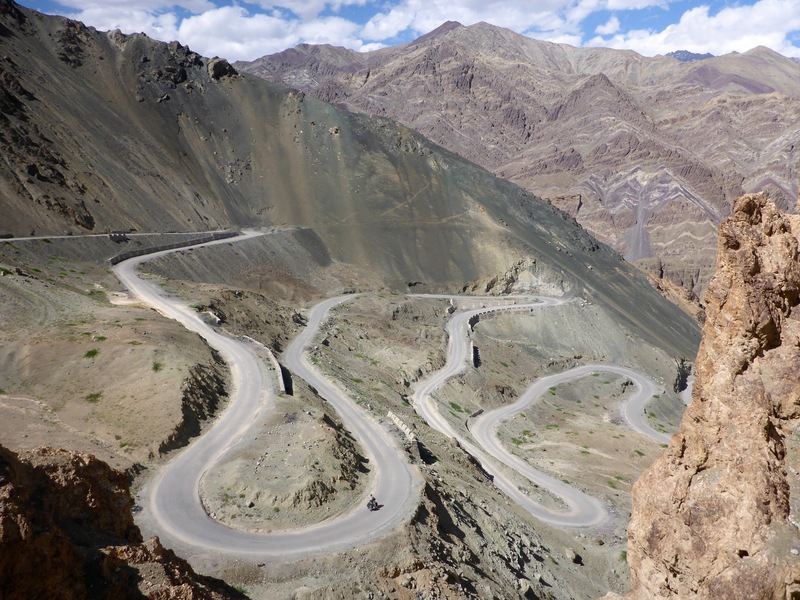 Next were the Jalebi Bends – a truly awesome descent. At the bottom, we couldn’t stopping talking about what we had just ridden through. For me, it was easily one of the top five stretches of road that I have ever cycled. 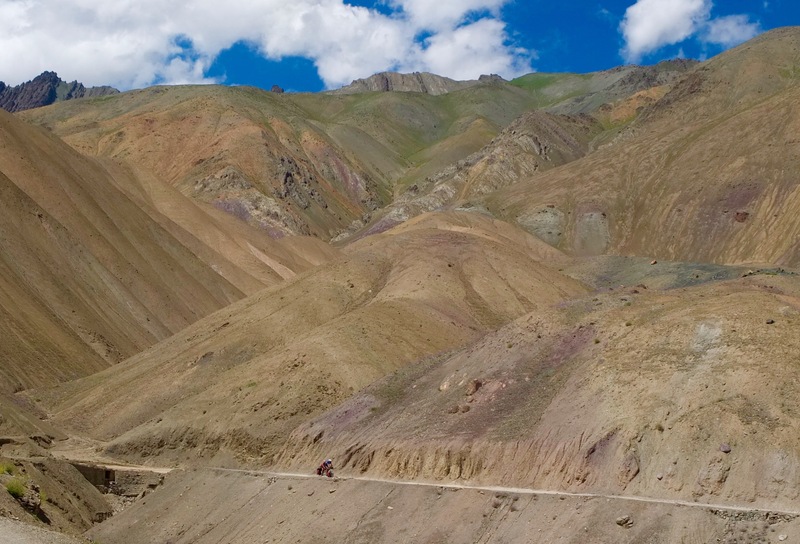 With only 100km left until Leh and the lure of good food and much needed recovery, we had ideas of completing the ride in one day. But with our continued stomach problems, we felt too weak and decided to split the ride into two days. The amount and variety of food in Leh was overwhelming. Pizzas, pastas, shakes, smoothies, Israeli food, Indian food, Tibetan food, German bakeries, muesli and yogurt… it was paradise. 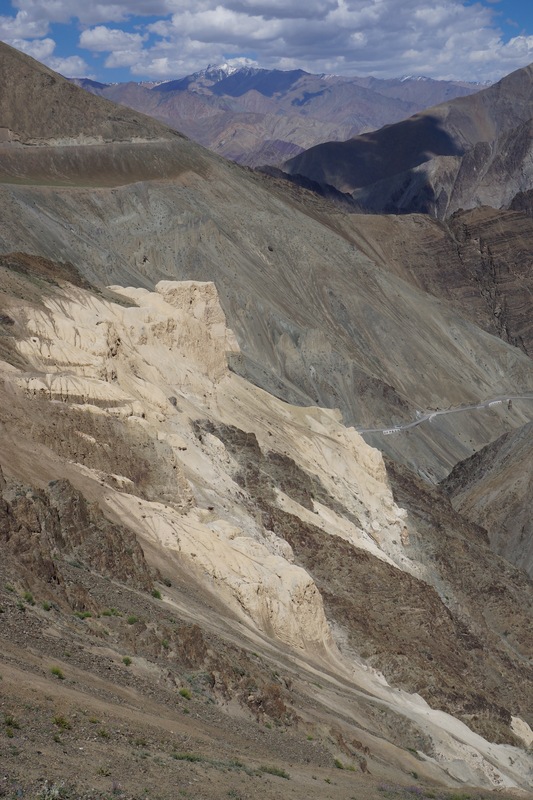 Leh was a good place to recover, even though none of us were able to feel 100 per cent. The battle was never-ending and it was taking its toll. My once large stock of Ciprofloxacin and Imodium pills for diarrhea was quickly disappearing. People weren’t kidding when they said that India was rough on the stomach. 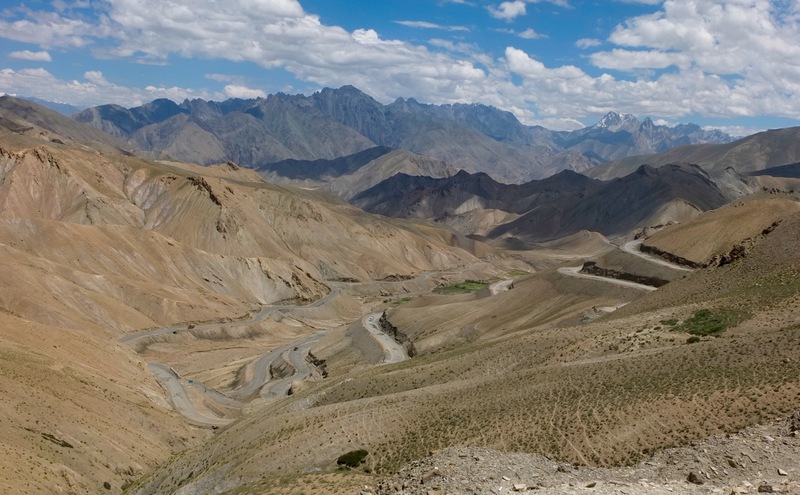 We had planned celebratory beer for reaching Leh, but in our weakened states, we lacked the energy. Instead, we ate and ate and ate. From Leh at 3500m we had about 120km to climb to reach the Taglang la at 5330m, the highest pass I would ever cycle (my previous record was the Gyatso La in Tibet at 5200m). With our current health issues, we hoped that we could regain enough strength for the challenge. This entry was posted in India by taraleighweir. Bookmark the permalink. Great read Tara! Beautiful pics!